Inside: Expecting a baby? 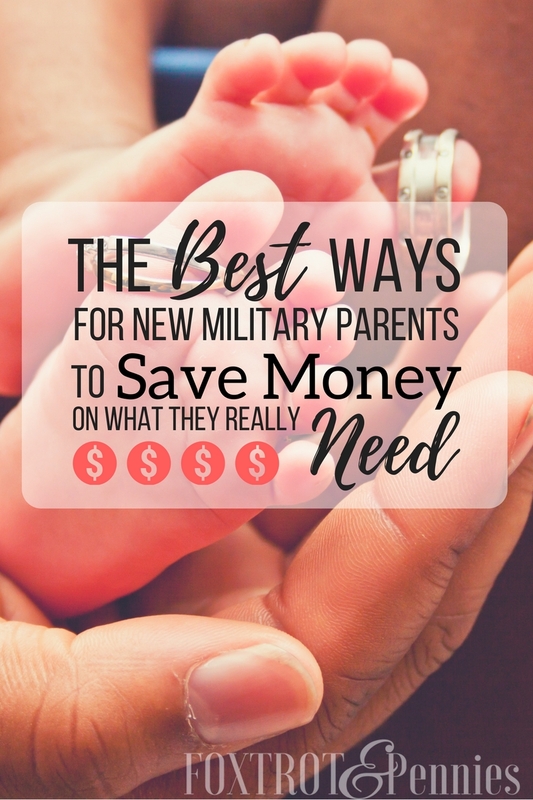 Here’s how military parents can save money on the things they actually need. 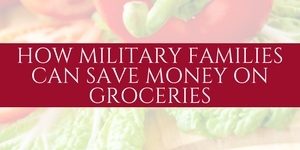 As much as 25% (that’s about 620,000) military families seek assistance just to buy food. It’s a fact that a growing family cause a lot of stress. Babies cost money. 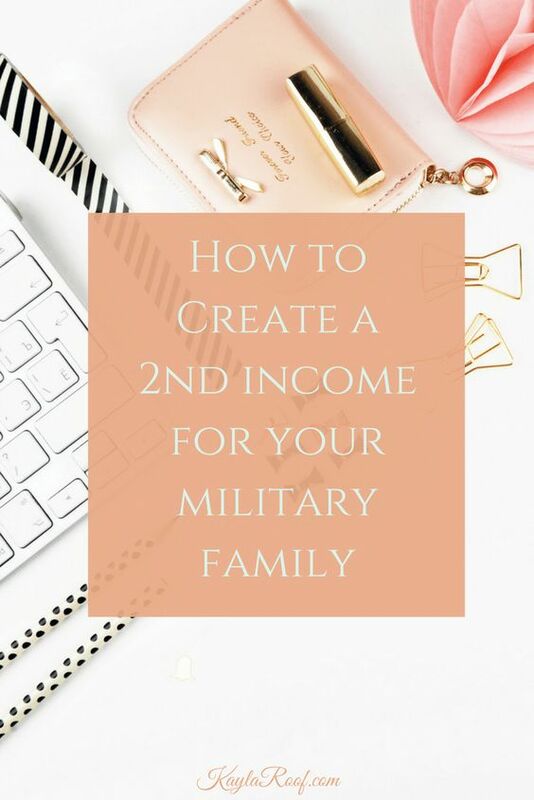 Not to mention, a military salary doesn’t always make things easy especially if you are having trouble finding a job in a new location or if you have decided to be a stay at home mom. I was a nurse before I met my spouse. I worked in the correctional setting so I made pretty decent money. My husband was also pretty established in his career before he joined the military. Within one year we got married, he went to basic, and we had a baby. Needless to say, our life (and finances) were turned upside down. Now, I’m not blaming the military for me not having a job. I made the decision to stay home with my son (and I do still pick up shifts for extra money here and there) and work from home but overall, both my husband and I took quite a pay cut. Our yearly income was cut by more than half and until he can switch jobs, we will continue to be pretty tight financially. That’s why I continue to find ways that our family can save money while still providing for our son. He is the priority after all. Wholesale clubs like BJs, Sams Club, or Costco are the way to go for these things, and all three have military discounts. BJs offers a discounted membership fee, Costco offers $50 in savings for new members, and Sams Club offers $15 for every new (or renewed) membership. Buying things that you will need a LOT of (like diapers and formula) will save you so much money, plus you can still use coupons. I wish I could have been able to breastfeed longer but my body decided it didn’t want to cooperate. Formula was a real source of struggle. It is SO expensive… I’m not going to go into my thoughts on this because I will get so off track but trust me, just talking about it makes my blood boil. Anyway, we saved a lot on formula at BJs. I purchased a 2lb container of Similac Sensitive (p.s. you can get the BJs brand even cheaper) for $28.99 and used a $5.00 off coupon (you can sign up to get coupons on Similac website– they will send you a lot of $5 off coupons!). Total price was $23.99 compared to $31.98 for a 1.86lb container at Walmart. However, if you can breastfeed (at least until they turn one) you will save approximately $576, yay! There is no way around it (unless you want to go the cloth diaper route- which cost more upfront but may save money in the long run) you will NEED diapers, and you will need a lot of them. Diapers (depending on brand) are pretty comparable to stores such as Walmart but you can usually get more for your money, plus wholesale clubs almost always have coupons for products like that. Not to mention, I’ve gotten super cheap name brand baby clothes for significantly less at stores like BJs. For example, a four set of PJs from carters (originally $34.00) for $7.98. We even got a newborn life jacket for under $20. 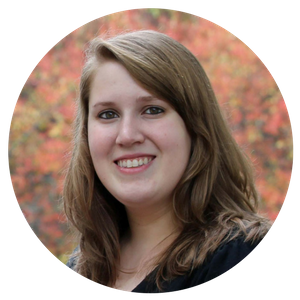 You can also check out programs like diapers.com and amazon family– they offer awesome discounts on diapers!!! They will cover these supplies for up to 36 months after birth (PER birth event.. so don’t worry, you’re covered with the second baby too). I already mentioned that breastfeeding for one year will save you at least $576. But you will also save another $299.99-359.99, and possibly more, especially if you need a hospital grade breast pump which can cost anywhere from $850-$1,549. Side note: You may require a hospital grade breast pump if you were separated right after birth due to illness or complication OR if you have to exclusively pump due to the baby not taking the breast properly. Learn more about Tricare covered breast pumps. I was unable to find a medical supplier that took Tricare standard in my area. However, I was able to very easily obtain one through Edgepark.com. They will walk you through the steps online and if you still have issues, you can call and a representative will help you. I purchased a lot of clothes from consignment shops at first. Especially maternity clothes. Then I realized I could save even more money by shopping at stores that have military discounts. Our favorite store for my son’s clothes is Old Navy. Pro tip: The BEST time of year to shop is immediately after Christmas. I was able to get 18 items of kid clothes for $36. All items I bought were on clearance (with an additional 30% off clearance sale) and then the 10% military discount. 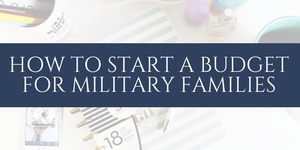 Sometimes stores in Outlet centers will have military discounts (like Gap, Carters, Gymboree, etc) and many times you can get a free coupon book by presenting your military ID at the service center. You can also get discounts on baby shoes at Stride Rite, Payless, and Kohls. Staying home isn’t for everyone, and thanks to a recent law being passed that allow spouses with professional licenses to transfer easily between states, many families may decide to go the “childcare” route. As everyone knows, childcare can be mega-expensive! 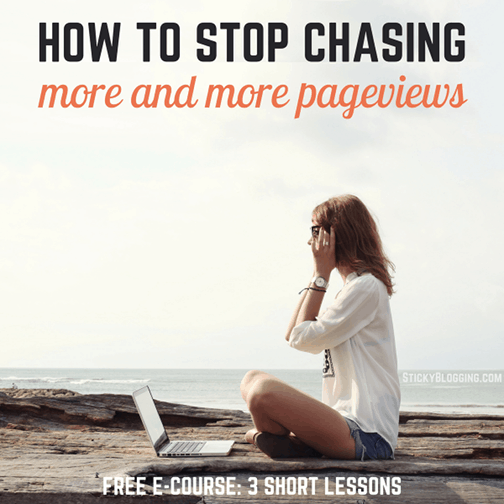 Don’t worry, there are still plenty of ways that you can save. Care.com– You can get a discount on the membership by going through USAA (if you don’t already have a USAA account, don’t worry it’s super easy to sign up and you don’t need to bank with them- although I highly recommend it). 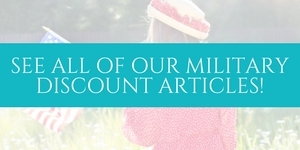 Cultural Care Au Pair– Will give military families a $575 discount. Again, you need to register online and use a code (the code is: PCMILITARY). EurAupair– Offers a $600 discount off program fees. 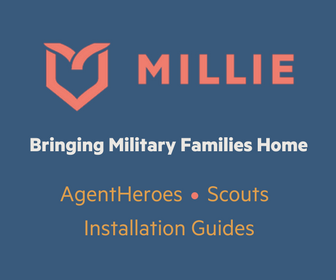 Kindercare– Offers fee assistance for active duty military families. Sittercity– Offer membership discounts, such as 25% off monthly, 50% off quarterly, and 25% off annual plans. It is important to remember that finances can be a major stress for relationships. You are one team and you should be making your decisions as a team. There should never be blame placed on another person unless there is truly an issue (gambling, shopping addictions, etc). My husband likes to spend but he has gotten significantly better since our son has come along. He never blames me for staying home, he supports me and my business, and we just make it work financially. Get creative when it comes to finding ways to save on the essentials. 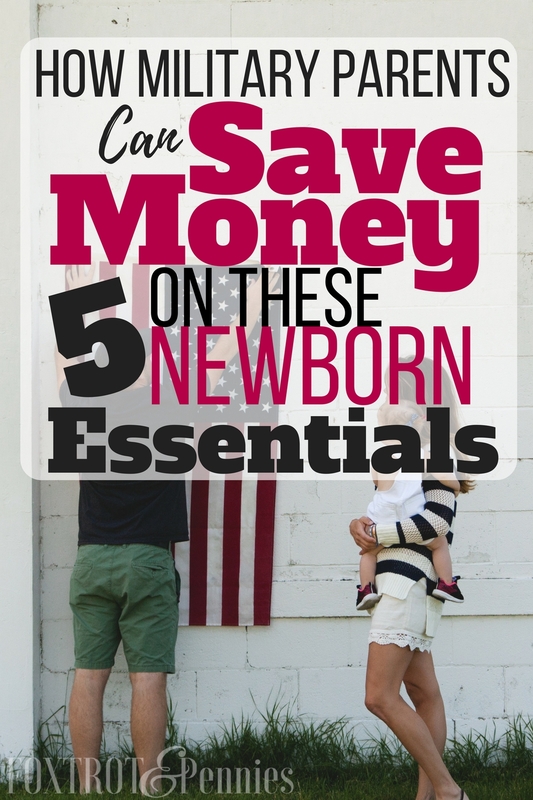 There are ways to cut spending on diapers, formula, day care, and more. 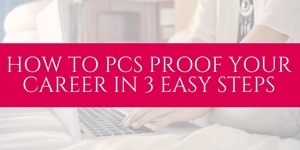 There are always ways you can earn money from home. I always keep in mind that we are both just starting (him with the military and me with blogging) and it will only go up from here! As for military discounts, do not ever feel bad about asking if one is available (of course, you should always be respectful if the answer is “no”). Companies set them up to thank service members for their sacrifice. In a military family, the whole family serves and makes sacrifices.